Q: According to media reports, the presidential election was held in a smooth manner in Kyrgyzstan recently. The vote tallies announced by the Central Election Commission show that Sooronbai Jeenbekov has been elected as the new president. What is China's comment on this? Has the Chinese side sent a congratulatory message to Kyrgyzstan? How do you view the development of China-Kyrgyzstan relations? A: The Chinese side congratulates Kyrgyzstan on its smooth general election and Sooronbai Jeenbekov on being elected as the new president. President Xi Jinping has sent a message of congratulation to Mr. Jeenbekov. The Chinese side respects the choice made by the people of Kyrgyzstan and supports Kyrgyzstan in pursuing a development path suitable to its own national realities. We believe that Kyrgyzstan will continue maintaining political stability, progress and prosperity and score new achievements in its national development. China and Kyrgyzstan are strategic partners with a sound momentum of growth being maintained in the bilateral relations. The Chinese side attaches great importance to its traditional friendship and mutually beneficial cooperation with Kyrgyzstan. China is willing to work with Kyrgyzstan to take the opportunity of jointly advancing the Belt and Road Initiative to deepen bilateral cooperation in various fields and move forward China-Kyrgyzstan relations so as to deliver more benefits to the two peoples. Q: According to media reports, yesterday, the US Department of Justice indicted two Chinese drug traffickers on charges of marketing fentanyl, the synthetic opioid in the US which was manufactured in China. Is the Chinese side aware of the case and helping the US Department of Justice to pursue these two people? The Department of Justice also said that most of the fentanyl being sold in the US through the Internet was manufactured in China and China must do more to crack down on the labs making fentanyl. Do you have any comment on that? A: I am not aware of the detailed information of the case mentioned by you. I would refer you to competent authorities. We have said before that the Chinese government takes the issue of fentanyl quite seriously. Although there is no abuse of fentanyl analogues in China, we have listed and regulated many types of fentanyl analogues. 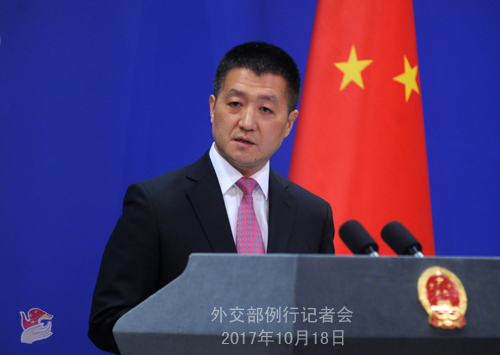 Meanwhile, the Chinese government adopts a highly responsible attitude to actively conduct cooperation with the United States and other countries within the legal framework. I believe you have also noted that on October 4, State Councilor and Minister of Public Security Guo Shengkun co-chaired the first US-China Law Enforcement and Cybersecurity Dialogue (LECD) with US Attorney General Jeff Sessions and Acting Secretary of Homeland Security Elaine Duke. The First US-China Law Enforcement and Cybersecurity Dialogue Summary of Outcomes issued after the LECD says that China and the United States held discussions on the relevant topic: both sides intend to continue to enhance cooperation on narcotics control and law enforcement, including jointly combating the illicit production and trafficking of fentanyl and fentanyl-related substances and precursor chemicals. 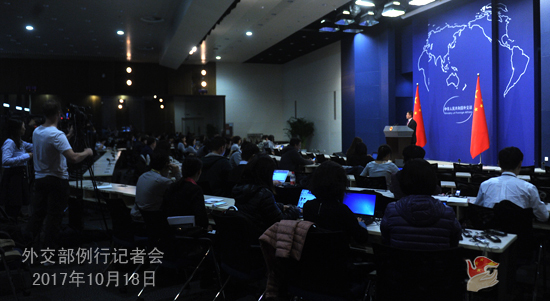 Q: Today, the 19th National Congress of the Communist Party of China (CPC) is convened. The DPRK sent a message of congratulation to the Chinese side. What is China's comment on this? A: As the 19th National Congress of the CPC is convened, we have received messages and letters of congratulation from many foreign political parties, political organizations and prominent political figures, including the congratulatory message from the Central Committee of the Workers' Party of Korea you mentioned just now. This shows that the international community pays great attention to the 19th National Congress of the CPC. We extend our thanks for this.